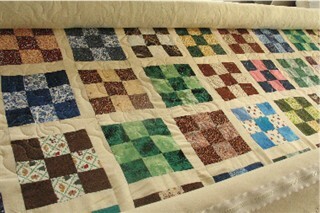 On the quilting table today I have a quilt that is headed to a family through Habitat for Humanity. It is a lovely scrap 9-patch with unbleached muslin sashings. I am quilting it with a pantograph called Ribbons and Roses. Lucky family! I just love these old fashioned quilt designs. Isn’t is amazing how beautiful a simple 9-patch is! as you already know, I’m a huge fan of nine-patch. It looks great.